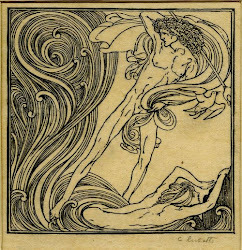 In February, I had wanted to write about the Edwardian Culture Network, a website devoted to 'various aspects of culture in Britain between the years 1895-1914', especially art and literature - but too many other subjects came up. The Edwardian Culture Network has published two main articles on Ricketts. 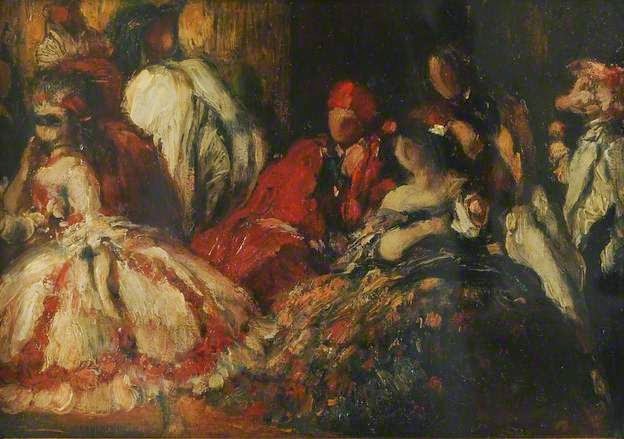 In January one of its founders, Samuel Shaw, wrote a review on Nicholas Frankel's selection of writings by Charles Ricketts, Everything for Art, and a month later Shaw published a piece in the 'Edwardian Encounters' section on a painting by Ricketts, 'A Fancy Dress Dinner Party' (1904). The figures have been identified (from left to right) as Lady Mary Davis, Sir Edmund Davis, Mrs Charles Conder (Stella Maris), Max Beerbohm, Mrs Amy Halford (Mary’s sister, and an important art collector in her own right), Charles Conder and Charles Ricketts. Ricketts dressed rather awkwardly for this occasion, and wore a masque of a pig's head, which wasn't the success he had hoped for. More of Shaw's fascinating essay on 'A Fancy Dress Dinner Party' can be read on Edwardian Encounters on Edwardian Culture Network.